Last weekend while I was visiting Steven and Jessica, we watched a show on PBS about Dale Chihuly and his “Chihuly over Venice” exhibition. I’ve always been amazed by the process of blowing glass, but Chihuly and his people take it to a whole other level. The Oklahoma City Museum of Art has a large Chihuly collection. I’m going to have to see if I can’t get Bill to go with me to check it out. I especially want to see the “The Eleanor Blake Kirkpatrick Memorial Tower”. Above is a link to the OKC collection. Check it out. The pictures are amazing, can’t imagine how beautiful it must be up close. Here is the progress so far on the February Monthly Dishcloth KAL. Sorry for the bad photo, but I just couldn’t get enough contrast to show the stitch definition. Appropriately for February, the pattern is turning out to be hearts. I didn’t think we had a chance for more snow until the weekend. But I just looked out the window and it’s snowing. I guess we’re getting payback for all the mild winters we’ve had for the last few years. I cast on for the Mid-Month Dishcloth KAL. Not enough progress to show. The Chain Link socks are coming along. The pattern is easy to remember but enough of a challenge to hold my interest. Surprisingly, it’s also a fast knit. We are going to brave the elements and go to the commissary today. Once we get off the side streets it shouldn’t be too bad. I finished the first of the KAL dishcloths for January. 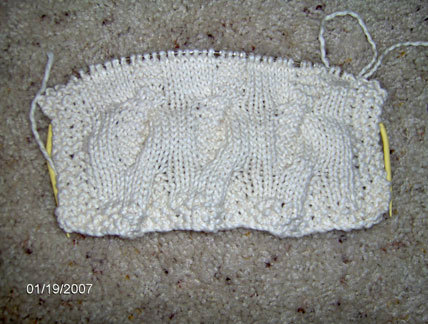 I like the way this one turned out, and especially liked knitting with the Cottontots yarn. 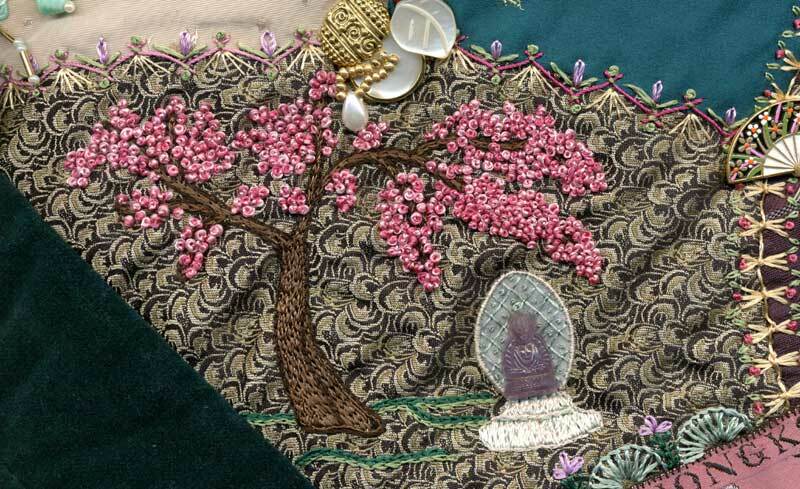 Next weekend, Jan 11-13 is the OKC Winter Quilt Show at the Cox Convention Center. I didn’t make it to last years show due to illness. This year I really want to go. I need the inspiration and am hoping that it kick starts my motivation. But, being on oxygen I will have to carry extra tanks, since we will be there for a while and doing a lot of walking. Yesterday Bill and I went to Penney’s and I decided to look for a rolling tote that wasn’t too big, but big enough to hold a couple of small cylinders. I got lucky and found this. Penney’s had it on sale for $49.99. It measures 17″ x 13″ x 8″ and will hold a couple of cylinders, plus I can use the front zipper pocket for things I would normally carry in my purse. I’ll still have room for any purchases I make at the vendors booths. 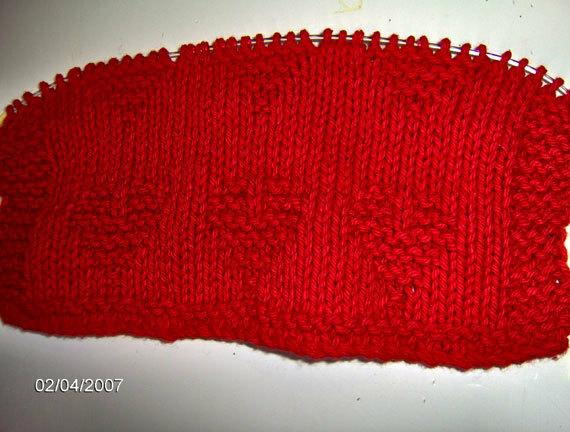 I’ve knit through day 3 of the dishcloth KAL and can now tell what the pattern will be. I’ll wait until I get further along before posting a pic and revealing the pattern. This go around I am using Bernats Cotton Tots 100% cotton yarn. It is really soft and easy to knit with. Finished the decreases on the second 4×2 rib sock and started down the foot. Hopefully will finish it this weekend if I can stay awake. Seems like when I sit down in my recliner in the evening that it is a signal for my eyes to close. I was up until almost 4am working on the jigsaw puzzle. Barely made a dent in it. I knew I should have gotten the easier one. The light made a glare on the pieces making it difficult. Either that or I’m just getting old. Nah! That can’t be it. Slept in late this morning. Woke up when Jeff called from Florida to wish Happy New Year and talk to Bill. I put a pork roast in the crockpot. Still need to clean the collard greens and start the Hoppin’ John (blackeyed peas and rice). Then it’s time to just relax. There’s an old saying about what you do on New Years Day is what you will do all year. 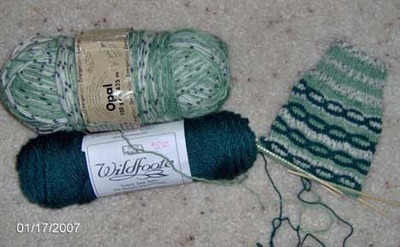 If that’s the case, I guess I need to do a little knitting or needlework today, too. This is Day 1 of the MonthlyDishcloth KAL for January, so it should get me started on the right foot for the year. 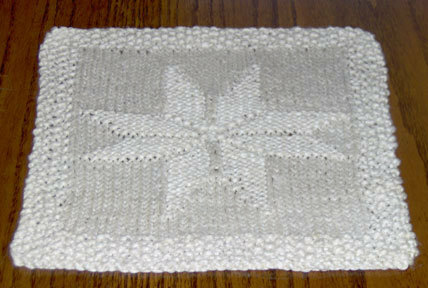 I didn’t post a picture of the last dishcloth because, although it is pretty, the design didn’t show up very well. I used a variegated cotton yarn. One of the best parts of these twice monthly KALS* is that I get 2 new dishcloths each month. 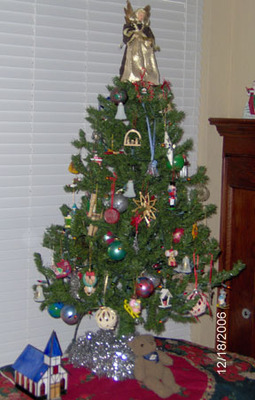 I finally finished trimming the tree. Took a while digging through the boxes to find all the decorations. Still haven’t located everything, but enough to make a decent looking tree. It’s really pretty at night with the chaser lights on. I have been doing some knitting. Halfway through the pair of navy fingerless mitts. The Mid Month Dishcloth KAL is on it’s 3rd day. Unfortunately, right now the pattern doesn’t show up too well in a picture. I’m using a variegated Sugar’n Cream yarn. 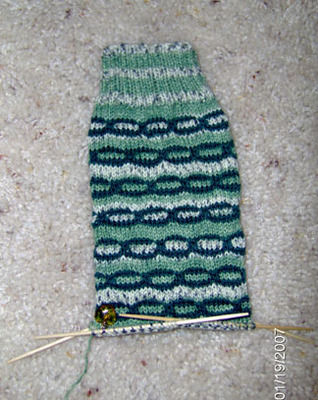 Hopefully the pattern will show up better the further along I get in the knitting. Found out Kerry will be coming on Wednesday. Jason has to work, so she will be by herself. Steven & Jessica will be here either Sat. or next Tues. Then we will go over to my Dad’s for a visit probably on Christmas day.